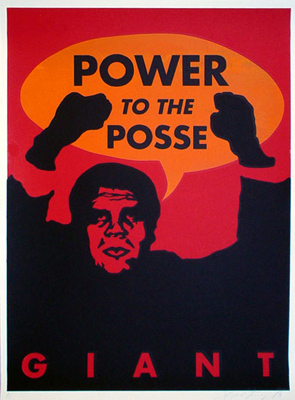 I did a poster with Andre-as-Black-Power-guy holding up his fists and saying “Power to the Posse,” though the original image I appropriated said “Kill Whitey.” As I was printing the posters, I got the idea to leave the thought bubble blank and paste them up on the street as a pseudo-Rorschach test to see what people would write in them. I tried it out, and although I never saw anything particularly awesome written in it, it inspired me to hand the posters over to some of my artist friends—KAWS, TWIST, Andy Howell, Tommy Guerrero, and Aaron Rose—and give them carte blanche with it. It’s always fun to find ways to create that sort of confluence of styles.